Identify key job positions and build talent pools, source passive candidates, track applicants and manage skills, resumes and attachments. Why you need the candidate management system? Identify key job positions and roles in your organization, track recruitings. Build you talent pools once you have a clear image of future talent demands, organize talent pools to source passive candidates. 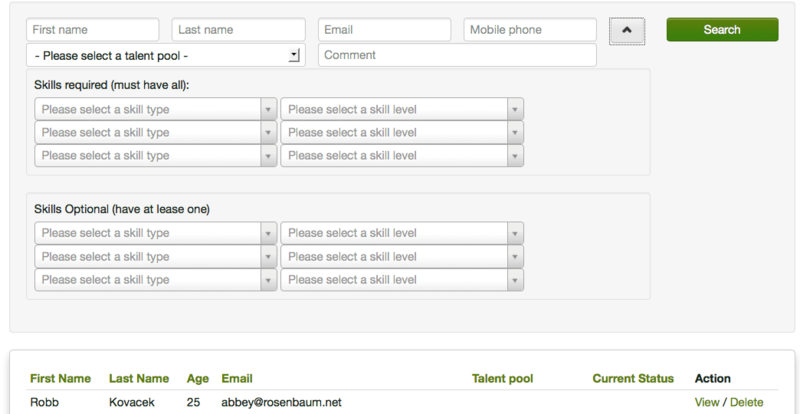 Filter and search talent from talent pools by different talent pools and the required the skill/competency levels. Our TMS system can help you create your own competency model and assess talent based on the skills/competencies created. Powerful full text search engine allows you to parse resumes and documents, and search by those attachments. Manage all the information of applicants, interviews, passive and active candidates and skill sets of each talent in our consolidated recruitment and resume database software. In today’s competitive marketplace, reactive recruiting is not enough. To ensure that your organization has a chance at hiring the best people, you will build talent pools and manage their skills. How many key job positions in your company? How many people do you need for each position three month later and one year later? Keep asking yourself those questions and forecasting your talent demands, You are making your first step into proactive talent management. With TalentLists Talent Management System you can build talent pools and manage their skills. Hiring the really talented employees is the most essential element of success of your company. With our free talent pools management system, You can easily build up your own talent pools to prepare for the succession and future talent demands. If you regularly find yourself sifting through piles of irrelevant CVs, desperately trying to find that perfect employee before the costs become too excruciating, then it’s time you create a talent pool. A talent pool is a 'ready made' pool of candidates interested in your company and your job openings. Learn more about why you should build your own talent pools, or, check out what other experts say for effective recruiting. We can help you recruit more effectively by providing talent pools management tools with which you can source better candidates and automate recruitment process. Recruiting is perhaps the most important step in the talent management life cycle. TalentLists' online talent acquisition system streamlines one of the most important steps in the employee life cycle: the hiring process. And with TalentLists’s 100% cloud based, fully integrated talent management solutions, global businesses can know that investment in their people is paying off for their business - and their bottom line. Check out our recruiting software features now! Create different talent pools for different job categories, evaluate and record level and experiences of each skill for each talent, quickly find and filter talent with the powerful talent search engine(skills required and skills plus). In TalentLists TMS software, we store all the following information in centralized databases, accessible from everywhere. And all those information are searchable with our powerful full text search engine.